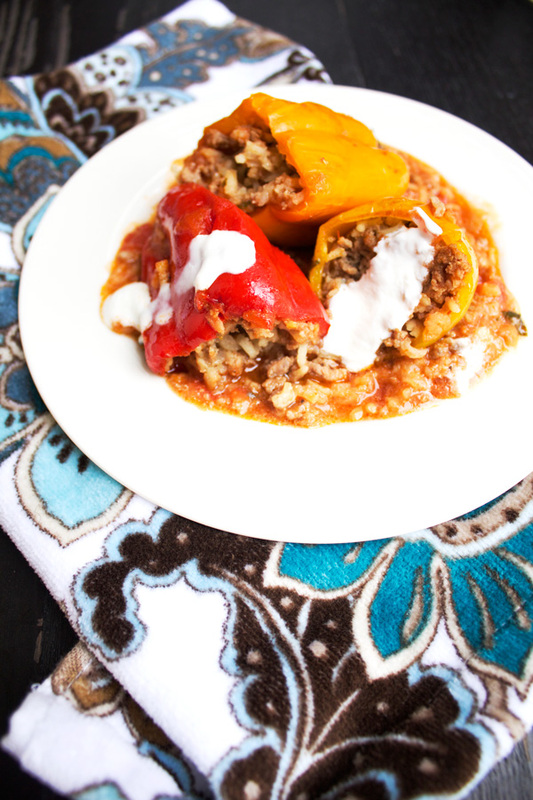 Simple stuffed peppers. Delicious, hearty, comfort meal. A perfect way to stay strong through the winter. 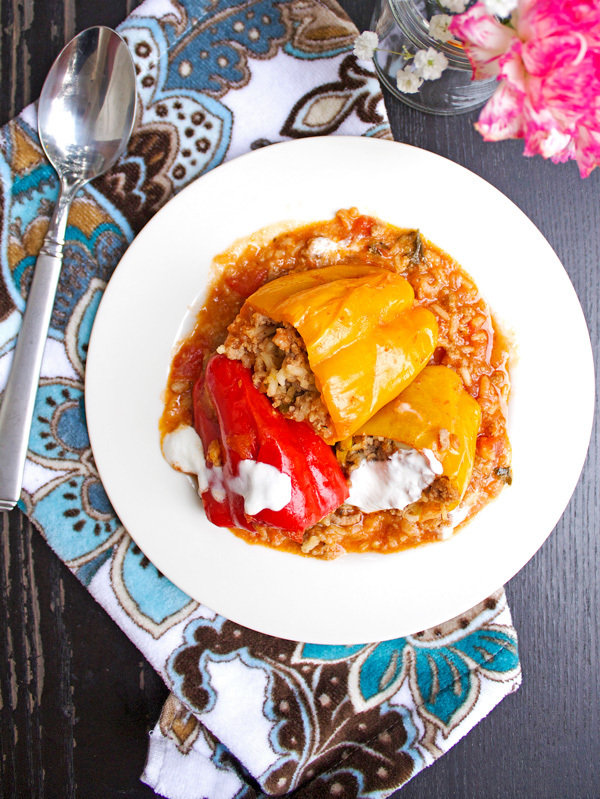 Bosnia boasts several dolmas including onions, eggplant, tomatoes, and zucchini ones. The real definition of a dolma is “stuffing for a vegetable.” However, in vernacular when dolmas are mentioned people assume you’re actually taking about a vegetable that’s been stuffed, not the stuffing itself.. Stuffed peppers look more complicated than they are. Like musaka, getting them right is more about preparation – your mise en place – than about skill. So before you start cooking anything, get the ingredients ready first, as there will be steps to do simultaneously. On one end you’ll skin the tomatoes, cut them up and place in a baking pan (together with 1 diced onion and 1 garlic clove) that will be simmering in the oven while you prepare the rest of the ingredients. Second act is the rice you’ll cook halfway and mix with ground beef, and onion plus garlci, that simmered for a quick second. Finally you’ll stuff the peppers, and put them into the pan with the tomatoes. Make sense? You’ll need two pots, one pan, and one baking pan. And a teaspoon for filling peppers with the stuffing to prevent your fingers from getting burned with hot ingredients. Before choosing your peppers, check this link out. Isn’t it the greatest list of peppers ever compiled? So don’t stuff the okra! Peel tomatoes, and mince together with one garlic clove and one onion. Place in a baking pan (or glass bakeware), pour 3.5 in ounces of oil, stir. Place in the oven, and turn up to 440F. Mince the remaining garlic and onion and heat up in a pot with a little bit of oil. Add ground meat, and simmer until meat is halfway done. Add seasonings, stir and remove from heat. Add rice in a smaller pot, and one cup of water. Cook on medium heat until rice is halfway done. Combine rice and meat and stir well. Cut tops of peppers, and deseed and wash them. Stuff them with the filling and place in the baking pan. Separately, mix 2 cups of water, tomato sauce, salt and sugar. Pour over the peppers, add parsley, and place back in the oven. Bake about 1 hour, frequently turning the baking pan, and the peppers inside around. Music for the video was kindly provided by Croatian band Dječaci (www.djecaci.net). 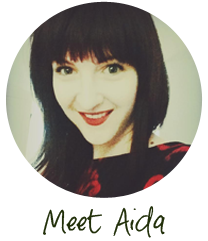 Welcome Carmen! I look forward to making your meatballs!! Feel free to drop me a note if you have any questions about the peppers. Perecft shot! Thanks for your post! This is my absolute favorite childhood recipe. I always have them with plenty of Greek yogurt topping. The best comfort food for me. Yes, sour cream or Greek yogurt on top take the flavor to a whole another level. I’m glad you have such great memories from childhood. This is so good! 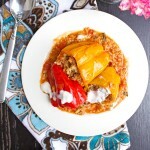 I am loving this so much more than Italian style stuffed peppers… my taste buds are singing! Thanks Miranda. It’s good to switch the recipes around every now and again. How do you make your Italian peppers?